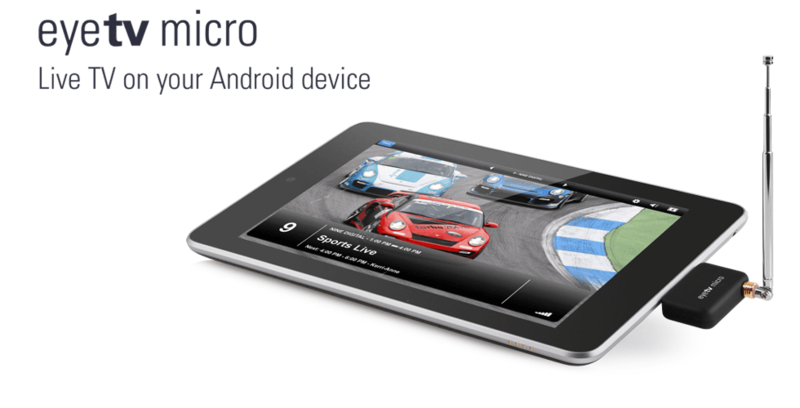 Watch live TV on your Android device with EyeTV Micro. Since the television signal comes from the attached telescopic aerial, you won’t need an internet connection or a Wi-Fi hotspot to watch TV. EyeTV Micro never touches your data plan, so you can enjoy real live TV in brilliant quality without waiting for any data to load. Just visit Google Play, download the free EyeTV Micro app to your Android device, and connect the compact EyeTV Micro TV tuner. Launch the app, choose a channel, and start enjoying live TV straight away. EyeTV Micro is the only TV tuner of its kind to offer flexible antenna options. Position the telescopic antenna for great reception on the go, or connect the rod antenna in areas with poor reception – you decide. The proven MCX connector always ensures optimal signal transmission and prevents damage to the TV tuner or Android device. Move it to the big screen. EyeTV Micro is the perfect fit for your Android smartphone or tablet. But even if you want to watch TV on a bigger screen, EyeTV Micro has your back: simply connect EyeTV Micro to your Mac or PC using the supplied Micro USB to USB cable and enjoy crystal clear live TV on your computer. You can even record your favourite TV shows – the award-winning EyeTV software for Mac and THC for Windows are included with EyeTV Micro! EyeTV Micro requires an Android device with a 1 GHz or faster dual-core ARM CPU, USB host mode functionality and Android 4.0.3 (“Ice Cream Sandwich”) or later. Playback of MPEG-4/H.264 video requires a processor with NEON support (e.g. Tegra3). Where does EyeTV Micro work? EyeTV Micro works in Australia, Belgium, France, Germany, Great Britain, Italy, Japan, Austria, Poland, Spain, Switzerland as well as any country that broadcasts standard definition MPEG-2 or MPEG-4/H.264 video. High definition channels, encrypted programs and/or DVB-T2 broadcasts are not supported.